Hope you had a Happy Easter, folks. Going right along with the whole egg theme for Easter we're all familiar with, I have a photo from Easter morning's breakfast! 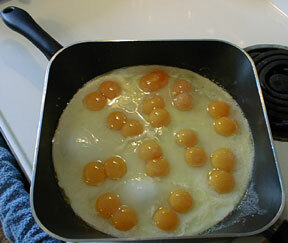 Now I have experienced perhaps as many as two double-yolked eggs on one day. But TWELVE?? The whole carton?? That just seems a little bit freaky. This is not a joke. I took this photo. It was a special occasion for the whole family. Hope it doesn't gross you out.